I got this card in the mail yesterday. 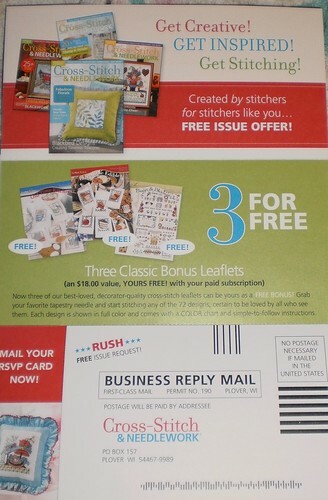 Look, an offer to get a year of Cross Stitch & Needlework for $20. I currently have $20. I'd get 6 issues in the coming year plus 3 free charts. I happen to be familiar with this magazine and they have some very nice projects every issue. I have a box full of craft magazines and a box full of kits and half-finished projects. Honestly, I need this magazine like I need bubonic plague. Still, $20 for more cross-stitch projects? Time to hit myself with the reality cloth and go pay my gas bill.